The death toll from widespread flooding and landslides in western Japan rose to 126 on Monday with more than 80 people missing and tens of thousands displaced in the wake of torrential rain. The number of deaths, reported in 12 prefectures, is the highest caused by downpours in Japan since 1982, when cataracts of rain hit Japan's southwestern area around Nagasaki Prefecture, leaving 299 people dead or missing. Although downpour since Thursday has ceased in most disaster-hit areas, the Japan Meteorological Agency warned the public of the danger of further landslides. Many people are believed to be cut off due to flooded roads. Evacuation orders or advisories were issued for up to 6.3 million people at one point, while around 11,000 people were staying in evacuation centers in 15 prefectures as of Monday evening, down from 23,000 the night before, according to the Fire and Disaster Management Agency. Prime Minister Shinzo Abe said during a meeting of a disaster response unit that the number of police, Self-Defense Forces and rescue personnel dispatched to the region had increased to 73,000 and financial support would be provided to disaster-hit municipalities. The unit, set up by the government during extreme natural disasters, was established for the first time since powerful earthquakes hit Kumamoto Prefecture in southwestern Japan in April 2016. The prime minister later canceled a trip to Europe and the Middle East scheduled from Wednesday to deal with the disaster and visit areas affected. 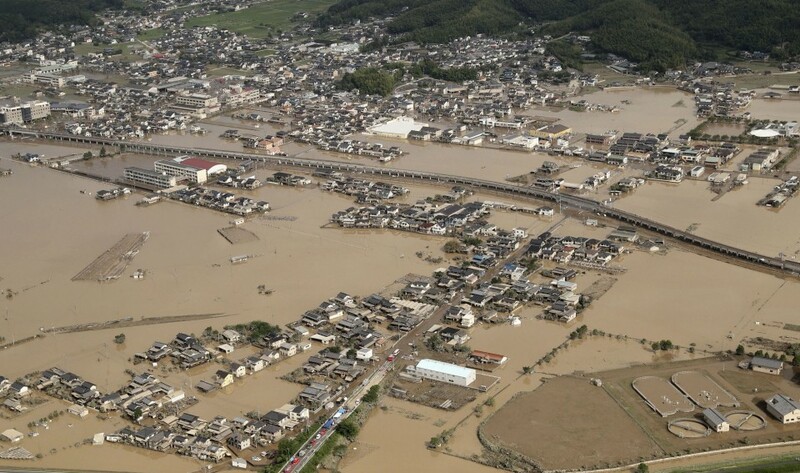 In Okayama Prefecture, one of the hardest-hit areas, more than 1,000 people were temporarily trapped on the roofs of buildings following the bursting of three dikes on the nearby Oda River. Most of them were rescued by boat or helicopter. In the Mabicho district, about 1,200 hectares, or one-third of the area, was submerged. About 4,600 homes were inundated in the area, leaving 3,000 to 5,000 residents displaced. All patients and staff in a hospital in the district were evacuated early Monday. The Ministry of Land, Infrastructure, Transport and Tourism mobilized pumper trucks to drain the inundated area but it is likely to take about two weeks. In neighboring Hiroshima Prefecture, one of 12 people who went missing after landslides in the town of Kumano was found dead. 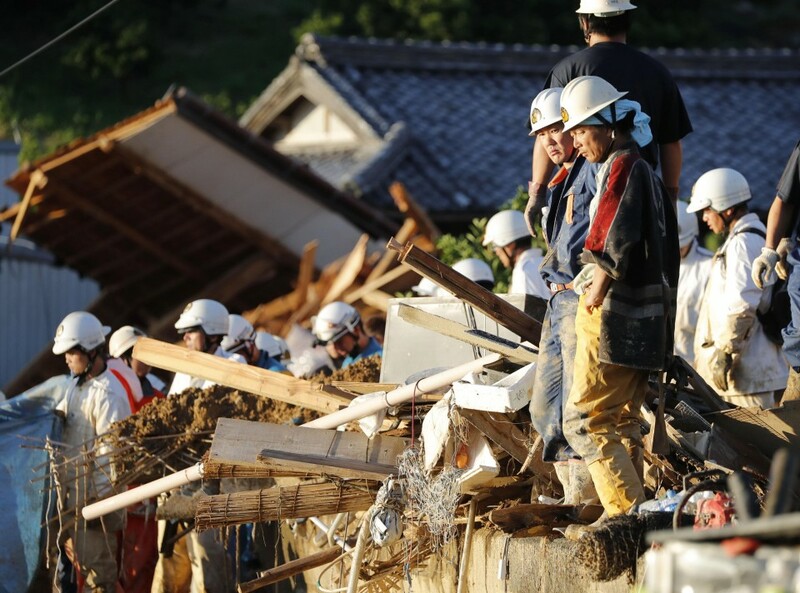 The body of a 3-year-old girl was discovered in the city of Fukuyama after she was washed away from her home following the collapse of a reservoir. The land ministry has confirmed at least 238 landslides in 28 prefectures and flooding at more than 200 locations along rivers managed by the state and local authorities. Businesses continued to be affected, with automaker Mazda Motor Corp. and Daihatsu Motor Co., a minivehicle-making unit of Toyota Motor Corp., suspending factory operations in Kyoto, Hiroshima and Yamaguchi prefectures. The companies decided on the suspensions to ensure the safety of employees amid transport disruption as well as due to uncertainty over the procurement of auto parts. Panasonic Corp. said it pushed back its plan to resume operations Monday at its Okayama plant producing professional video cameras as it continued to assess damage at the factory inundated by the torrential rain. About 270,000 homes were suffering water outage in 12 prefectures as of Monday evening. Roads were also damaged and flooded in many areas and railway services disrupted. In seven prefectures, about 5,100 homes faced blackout as of Monday evening, according to the Ministry of Economy, Trade and Industry. Damaged roads have kept workers from entering affected regions, delaying power recovery in some places. According to the transport ministry, 10 railroad operators were suspending services on 32 routes in western Japan or elsewhere as of Monday evening.